GetDivorcePapers.com provides professionally completed, 100% court-approval, money-back guaranteed Michigan divorce forms. Just create an account, complete the interview, and file for divorce. Our case managers do all the work for you, and send the completed Michigan divorce forms when they are ready to be filed. 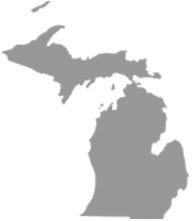 To file for divorce in Michigan, at least one person must have been a resident for 6 months. They should also be resident of the country where grounds occurred for at least 10 days. However, in cases where one of the spouses is a foreign national and there is a danger of children being taken away to that country, the 10-day rule can be dismissed. In Michigan, there is really one reason on the basis of which the divorce is filed for. That is that the marriage has been broken to the extent that there is nothing left and no reasonable chance that the differences can be reconciled and the relationship saved. Moral character of the parents. The needs, both physical and emotional condition of the child. Inclination of the child towards either parent. Emotional ties existing between parents and children. Desire of each parent to meet all needs of the child. Childs adjustment and attachment to current home, community and education. Physical and emotional health of all involved. The state of Michigan is one of "equitable distribution". Any property, whether gift, inheritance or personally purchased by the individual shall remain his or hers. Any mutual property or asset purchased after marriage will be distributed based on factors like the income of each individual and their financial state, along with the consideration of how much each invested in the said property. Other factors to be considered will be length of the marriage, prior marriages of each spouse, source of the property and reasons for divorce. Ability of the spouse to be able to pay alimony. The Child Support Formula is followed by the State of Michigan when deciding Child custody. Either of the parents may be ordered to pay child support. The court may also require that the parent paying support file a guarantee bond concerning the support payments. This support may also include health coverage and education of the child. All payments will be made through Michigan Friend of the Court Bureau. Both parents are required by law to keep the Bureau informed of their personal particulars including current address, source of income and health insurance coverage. Though meditation is not voluntary, however voluntary mediation is available especially in cases concerning children. There is no need of a lawyer when applying for divorce in the state of Michigan. A divorce case which is filed without any help of an attorney in any of the states is known as Pro Se Divorce. Literally, Pro Se is a Latin phrase and it means "on her or his own". Process of getting the divorce without the help of lawyer may vary from one State to another. These types of divorces are perfectly legal and enforceable in Michigan, and are actually very convenient. Usually, once settlements have been made regarding property distribution and custody matters among the spouses in case of a mutual divorce, Pro Se Divorces are filed.